Something that resembles a miracle has happened to concrete, and you are in for a surprise if you have not had a chance to see what is going on. Concrete, the workhorse of the building trades, has undergone a transformation that has changed it from an ugly duckling to the star of the show. Roman builders used concrete, but they were late comers when compared to the Egyptians. Fortunately for builders of today, technology has made remarkable advances that have turned concrete into a thing of beauty. The options for innovative applications that are available to you now are nearly endless. Innovative treatments for concrete include etching, staining and stamping that have opened the way for home and business owners to consider alternative flooring options. One of the most dramatic new treatments is produced through concrete publishing. Stone floors that you expect to pay a heavy price to have in your home or business are now available at a fraction of the price. The product retains all of the qualities that you admire about it, including strength, durability and permanence. The grainy texture that is typical of concrete is not visible in a surface that is finished by polishing. Floors of the future that are made of polished concrete are easily the equal of natural stone. As the aggregate is revealed through the polishing process, the characteristics of stone are visible. Polished concrete floors have none of the negative aspects of stone. They do not stain or chip, and they require only a minimal effort to remove dirt or sand that can create scratches on the surface. Refinishing at intervals of 10 years can keep the floors looking new. As a homeowner, you can benefit from using polished concrete flooring in several ways. No other covering is needed, making it an inexpensive way to go. You have a choice of designs in many colors that can match any interior décor. The ease of cleaning with a damp mop and the long life cycle of polished floors add to potential savings over the years. As a business owner, you can reap even more benefits by using it in a commercial environment. In addition to the advantages of concrete polishing in a residential setting, you get a surface that resists wear by foot traffic. Low maintenance costs for large areas can save significant sums rapidly. From an aesthetic standpoint, you get a surface that is capable of reflecting light more efficiently than is available with other floor options. The high reflectivity equates to lower energy costs while projecting a clean and fresh appearance. 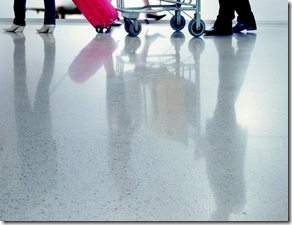 Polished concrete produces a sheen that may vary according to the appropriateness of the product for specific uses. 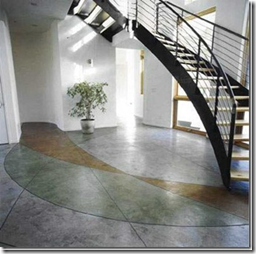 Concrete polishing is a multi-step process that can produce variations in glossiness. As an owner of a home or office, retail store, showroom, restaurant or hotel, you can specify the effect that you prefer. The versatility of the product marks it as a valuable asset for your floors of the future. This information was brought to you on behalf of RS Concrete Solutions, an innovator in concrete polishing techniques.